Headache is one of the most common complaints seen in a Traditional Chinese Medicine clinic. According to Traditional Chinese Medicine (TCM) the disharmony patterns which can cause headaches cover a wide spectrum of possibilities and in many cases a person can experience a range of headaches of which the classic Migraine is only one. One of the strengths of TCM is to diagnose and treat the underlying cause of an illness and not just the symptoms which enhances the potential for improving and/or curing an ailment. TCM’s unique perspective concerns understanding the Qi (Vital Energy) functions of the body and forms the basis for diagnosing and treating any illness. Constitution – The parent’s general health and health at the time of conception, also the health of the mother during pregnancy are all factors which influence a person’s constitution. Susceptibility to illnesses due to inherited constitutional weakness must be considered when assessing a person’s health. Emotions – Emotional factors are a frequent cause of disease and often play a major role in headache patterns. A recent study in UCD reported that “84% of people with migraine also suffer from a combination of anger, fear, worry and depression.” This is well understood in TCM as “Emotional Factors” and is a major category of disease causes. Anger, worry, fear, shock and excess mental work can affect the energetics of the body. For example, since Liver Qi (Vital Energy) governs the smooth flow of Qi throughout the physical, emotional, and psychological/spiritual levels of a person, these emotions can be a trigger or resulting symptom for Migraine. Overwork – This is a common complaint of all ages in modern society. Overwork can weaken the constitution and develop into a myriad of health problems, a common one being headaches of all types. Excessive Sexual Activity – TCM examines every aspect of human activity in its assessment of health and disease. Sexual excess can deplete one’s Qi and is relative to each person’s state of health. In TCM this can deplete the Kidney Qi and lead to headaches. Diet – TCM Dietary Therapy is concerned with energetic properties inherent in the foods we eat. Irregularities in the types and quantities of foods consumed which are inappropriate to a person’s state of health are a major cause of disease. This is a major factor when one considers the classic “trigger” foods in Migraines. Accidents – Accidents can damage the head causing Blood Stasis and generate a chronic headache condition which can later develop into Migraine. Childbirths – Too many childbirth’s, too close together can seriously weaken the Liver Qi, Kidney Qi and other energy vessels connected to the uterus. The energy depletion can cause various types of Deficiency headaches which may also develop into Migraine. External Pathogenic Factors – The main External Pathogenic Factors (EPF) which can cause headaches are Wind, Cold and Dampness. These can affect the Qi Channels in the head leading to certain types of headaches causing heaviness, stiffness and pain. According to TCM theory, Vital Energy (Qi) courses throughout the entire body via twelve main Channels like invisible rivers of energy in definite directions and at various depths. Each channel is associated with a specific internal organ energetic function (ie. Heart Qi, Liver Qi, Kidney Qi, etc) and Qi integrates all the physical, emotional, and psychological aspects associated with that organ. Understanding the harmonious (and disharmonious) balance of these interconnected functions assists the TCM practitioner in diagnosing the root cause of an illness and guides them to selecting and administering the most effective treatment. The energy channels are divided into six Yang and six Yin channels. The head is where all the Yang channels meet bringing clear Yang to the head and orifices enabling the person to have clear sight, hearing, taste and smell. It is the highest point anatomically and energetically according to the flow of Qi in the twelve channels, and therefore more prone to the pathological rising of Yang energy (e.g. rising of Liver Yang, or Liver Wind) or External Pathogenic Factors (such as Wind, Cold, and Damp). Migraines include a variety of symptoms which fit into the TCM pathology of Liver Yang Rising. It develops when the Yang of the Liver “rebels” upwards creating an excess of Yang in the head. Although the root causes can vary, the most frequent for this kind of headache is emotional, especially anger, frustration or resentment (associated with Liver Qi disharmony) over a long period of time. Other underlying causes of Liver Yang Rising may be Liver Blood Deficiency, Liver Wind, Liver Yin Deficiency, Liver and Kidney Yin Deficiency and Liver/Kidney Yin and Kidney Yang Deficiency. Migraine Symptoms caused by Liver Yang Rising – Liver Yang Rising fills the head causing an intense, severe, throbbing or distending pain. It usually affects either or both sides of the head along the Gall-Bladder Channel or the temple or eyebrow or behind one or both eyes. The Migraine is frequently accompanied by nausea or vomiting due to the Liver Qi disharmony invading the Stomach. Other common symptoms include visual disturbances, dizziness, tinnitus, deafness, dry throat, insomnia, irritability, a red tongue body and wiry pulse (both signs of Liver Qi disharmony). After a diagnosis is formulated from the presenting signs and symptoms and the underlying causes are confirmed, the relevant TCM treatment principle and treatment therapy would be selected. 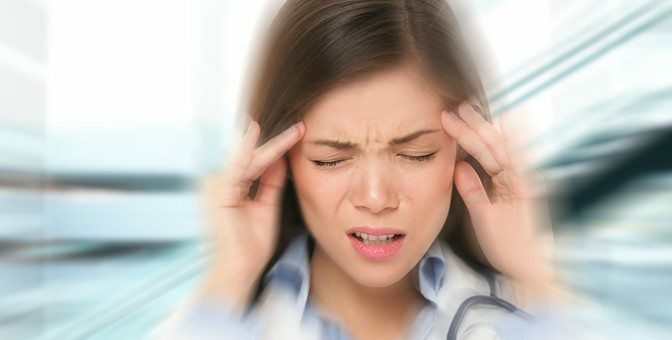 One of the most common causes of Migraine headaches is “Liver Yang Rising.” The practitioner would direct the treatment principle to “pacify the Liver and subdue the rebellious Yang”. Acupuncture and/or Chinese herbal medicine would be the treatments of choice, but other TCM therapies such as moxabustion, cupping, therapeutic massage (Tui Nai), Chinese dietary therapy and therapeutic exercise (Qi Gong & Tai Chi) may also be appropriate. Lifestyle advice can also be recommended and is a vital component in TCM treatment and especially effective for treating Migraine. Helping the patient identify aspects of their lifestyle that may be contributing to, or causing their illness encourages them to understand their problem and take responsibility for their health. Along with effective treatment administered by the TCM practitioner, the patient should not only begin to manage their complaint, but more importantly improve their overall health with a view to a cure. Practitioners: Janetta Cladingbowl and Christopher Davala.